It’s the middle of August, and a group of rising UMBC sophomores enters the classroom with anticipation. “Once everyone walks into the lab, you start hearing ‘Yes!’ across the room from people checking on their experiments,” says Fatma Abker ‘19, chemical engineering. The students, all participants in the BUILD Training Program (BTP) at UMBC, are checking to see if their petri dishes successfully grew lawns of bacteria, which they hope are infected with bacteriophages—viruses that only infect bacterial cells. The goal is to discover never-before-seen viruses, sequence their genes, and add them to an international repository of genetic data. As the first scientists to identify these viruses, the students also get to name them. This three-week intensive research project is known as “Phage Hunters.” It’s also taught as a full-semester course in the fall, followed by a bioinformatics-focused data analysis course in the spring. 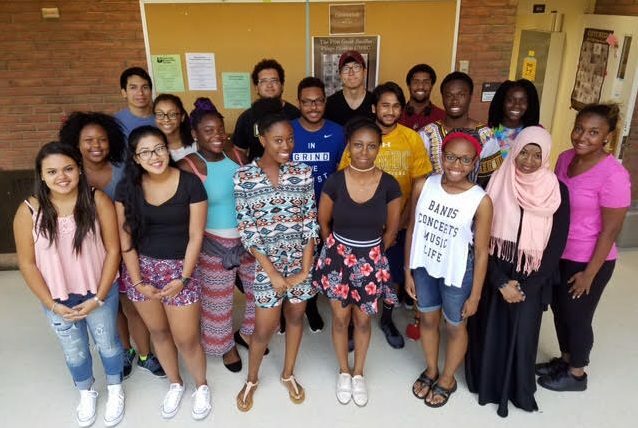 The accelerated summer course, though, plays an important role in the BTP, which is supported by the STEM Building Infrastructure Leading to Diversity (BUILD) at UMBC Initiative. Participants in the first cohort of STEM BUILD at UMBC; photo by Rob Nunn. UMBC was awarded over $18 million from the National Institutes of Health in 2014 to create a national model of comprehensive supports to expand and increase the success of undergraduate students pursuing STEM degrees. Each year, a subset of the incoming freshmen who have declared interest in the biomedical and behavioral sciences are encouraged to apply. Qualified candidates are randomly placed in either the BUILD Training Program (BTP) or one of two comparison groups. In this way, the BTP functions as both a support initiative for students and a research study to improve future supports. The BTP research study, Ott explains, “investigates how we can best support students in the STEM fields so that they go on to persist in the STEM field and be competitive for jobs, graduate and professional schools.” Program administrators track the progress of students in the BTP and comparison groups to determine how effectively and efficiently various factors can boost student success. BTP students hear guest lectures from STEM professionals to learn about career possibilities, participate in various courses and enrichment activities, and receive intensive mentoring, particularly through group experiences. They are also required to live on campus with other first year students in the STEM Living and Learning Community, which was established with the first BTP cohort and is expanding in size each academic year as a sustainable legacy of the STEM BUILD initiative. Of 18 participants working on 16 experiments during the summer, 12 produced phage DNA that were of high enough quality to be sequenced, and five were selected for sequencing. Steven Caruso, senior lecturer in biological sciences and Phage Hunters instructor, says that’s “a remarkably high success rate.” Since the Phage Hunters program began at UMBC in 2008, almost 500 students have participated, discovering more than 250 unique phages. The Phage Hunters program is part of the BTP’s research enrichment core, led by Philip Farabaugh, professor and chair of biological sciences, which focuses on coordinating research opportunities for students. The program also includes other intensive STEM success programs, like a six-week summer research internship for students at collaborating community colleges in Anne Arundel, Howard, Montgomery, Baltimore, and Prince George’s counties, and at Gallaudet University. Image: Students at work in a UMBC organic chemistry lab taught by Mark Perks; photo by Marlayna Demond ’11.